Do Cells Rock Out? Is There a Healing Sound? Can sound affect how your genes work? Cells, the fundamental units of life, are equipped with a variety of environmental recognition systems. Aside from substances such as chemical signals, they can recognize and respond to pressure, gravity, temperature, and light. For example, the cells in your eyes reading this sentence are equipped with systems that are specialized to process light. In a new PLOS ONE study, scientists from Kyoto University's Graduate School of Biostudies have shown that certain 'mechanosensitive' genes are suppressed when subjected to audible sound. Moreover, these effects vary depending on cell type, where some don't show any sensitivity. "Much research has been done on these specialized cells, but nobody has looked into the cellular response to audible sound," explains Masahiro Kumeta, lead author of the study. "Sound is arguably the most important and ubiquitous environmental information we receive. So that brings up the question -- do cells recognize sound?" Scientist from Kyoto University shown that certain 'mechanosensitive' genes are suppressed when subjected to audible sound, and these effects vary on cell type. The team conducted their experiments by exposing a variety of cells types to different sounds and performed gene expression analyses over time, focusing on genes that are known to react to physical stimuli. "One such gene we examined helps in bone formation, and is known to be upregulated with low-intensity ultrasound pulses," continues Kumeta. "The other genes were associated with wound healing and the extracellular matrix." Series of cells were placed in an incubator outfitted with a full-range loudspeaker. After several hours of exposure to sounds with specific frequencies, expression levels of the target genes were analyzed. The team found that these mechanosensitive genes were suppressed by up to 40% with only one to two hours of exposure. Moreover, after the genes were suppressed, the effects remained for at least four hours. The response was also dependent on waveforms and decibel levels. When exposing the cells to square or triangle waves, gene suppression was not as significant compared to sine waves on any tested frequency. Additionally, some genes did not show compounded suppression at higher decibels while others were reduced even further. Kumeta says this indicates that sound stimulation induces different responses in the cell. The results also showed that such stimulations affect cells differently according to cell type. Cells that would eventually become bone or skeletal muscle showed the most suppression, while cells that had already differentiated had almost no response. "Our research has found that audible sound stimulation leads to specific genetic responses," adds team leader Shige H Yoshimura. "These data also show that at least two mechanisms are involved: transcriptional control and RNA degradation. Both are key players in controlling how much proteins are made in the cell." The team is planning to continue testing their hypotheses, as well as search for other genes that have been affected, such as ones that may have been upregulated by audio stimulation. "Further studies using different sounds, cells, and experimental setups are sure to uncover more of this novel relationship between life and sound," continues Kumeta. "In addition to the cellular level," concludes Yoshimura, "we will also focus on tissue- and organism-level effects to investigate the biological significance of sound response in living systems." An international team of astronomers led by Giuseppina Battaglia, researcher at the Instituto de Astrofísica de Canarias (IAC), finds signs that the outer halo of the Milky Way contains stellar remains of massive dwarf galaxies that were devoured by our own. The extended stellar haloes are predicted to be an ubiquitous feature around Milky Way-like galaxies and to consist mainly of the shredded stellar component of smaller galactic systems. Most of the information we have about the Milky Way stellar halo comes from its inner region, which we can observe close to the solar neighborhood. However, for the first time the chemical properties of the external regions of the halo of our galaxy were explored with high resolution spectroscopy in the optical of a sample of 28 red giant stars at large distances from the Sun. The method that was used, i.e. a spectroscopic analysis, consists in separating the light of the stars in its different frequencies in order to obtain information on the star’s chemical composition. The analysis of the chemical properties of the stars can provide information on the characteristics of the environment in which they were born. “The abundance of some chemical elements in the stars in the external regions of the Milky Way halo - explains Giuseppina Battaglia, astrophysicist at the IAC and first author of the article - was found to be surprisingly different from the information we had concerning the inner regions of the halo”. On the other hand, several similarities were discovered with the chemical composition observed for stars in nearby massive dwarf galaxies, such as Sagittarius and the Large Magellanic Cloud. These signatures tells us that the external regions of the stellar halo might contain the remains of one, or more, massive dwarf galaxy, devoured by the Milky Way. Our Milky Way galaxy and its small companions are surrounded by a giant halo of million-degree gas (seen in blue in this artists' rendition) that is only visible to X-ray telescopes in space. University of Michigan astronomers discovered that this massive hot halo spins in the same direction as the Milky Way disk and at a comparable speed. For this study data from about 100 hours of telescope observing time were used, obtained on facilities in both the Northern and Southern hemisphere. Specifically, the team used the Very Large Telescope "Kueyen" (UT2) of the European Southern Observatory in Paranal and the Magellan telescope Clay in Las Campanas, both in Chile, as well as the Hobby Eberly Telescope, in Texas. Every galaxy harbours a supermassive black hole at its center. A new computer model now shows how these gravity monsters influence the large-scale structure of our universe. Time evolution of the cosmic magnetic field strength. Blue/purple shows regions of low magnetic energy along filaments of the cosmic web, whereas orange and white indicate regions with significant magnetic energy inside halos and galaxies. The displayed region is taken from the TNG100 simulation and is 10 megaparsec wide. The research team includes scientists from the Heidelberg Institute for Theoretical Studies (HITS), Heidelberg University, the Max-Planck-Institutes for Astronomy (MPIA, Heidelberg) and for Astrophysics (MPA, Garching), US universities Harvard and the Massachusetts Institute of Technology (MIT), as well as the Center for Computational Astrophysics in New York. The project, "Illustris - The Next Generation" (IllustrisTNG), is the most complete simulation of its kind to date. Based on the basic laws of physics, the simulation shows how our cosmos evolved since the Big Bang. Adding to the predecessor Illustris project, IllustrisTNG includes some of the physical processes which play a crucial role in this evolution for the very first time in such an extensive simulation. First results of the IllustrisTNG project have now been published in three articles in the journal Monthly Notices of the Royal Astronomical Society. These findings should help to answer fundamental questions in cosmology. At its intersection points, the cosmic web of gas and dark matter predicted by IllustrisTNG hosts galaxies quite similar to the shape and size of real galaxies. For the first time, hydrodynamical simulations could directly compute the detailed clustering pattern of galaxies in space. Comparison with observational data - including newest large surveys - demonstrate the high degree of realism of IllustrisTNG. In addition, the simulations predict how the cosmic web changes over time, in particular in relation to the underlying "back bone" of the dark matter cosmos. "It is particularly fascinating that we can accurately predict the influence of supermassive black holes on the distribution of matter out to large scales," says principal investigator Prof. Volker Springel (HITS, MPA, Heidelberg University). "This is crucial for reliably interpreting forthcoming cosmological measurements." TNG100-1: Fullbox composite which combines gas temperature (as the color) and shock mach number (as the brightness). Red indicates 10 million Kelvin gas at the centers of massive galaxy clusters, while bright structures show diffuse gas from the intergalactic medium shock heating at the boundary between cosmic voids and filaments. In another study, Dr. Dylan Nelson (MPA) was able to demonstrate the important impact of black holes on galaxies. Star-forming galaxies shine brightly in the blue light of their young stars until a sudden evolutionary shift ends the star formation, such that the galaxy becomes dominated by old, red stars, and joins a graveyard full of "red and dead" galaxies. "The only physical entity capable of extinguishing the star formation in our large elliptical galaxies are the supermassive black holes at their centers," explains Nelson. "The ultrafast outflows of these gravity traps reach velocities up to 10 percent of the speed of light and affect giant stellar systems that are billions of times larger than the comparably small black hole itself." Thin slice through the cosmic large-scale structure in the largest simulation of the IllustrisTNG project. The image brightness indicates the mass density and colour visualizes the mean gas temperature of ordinary ("baryonic") matter. The displayed region extends by about 1.2 billion light-years from left to right. The underlying simulation is presently the largest magneto-hydrodynamic simulation of galaxy formation, containing more than 30 billion volume elements and particles. IllustrisTNG also improves researchers´ understanding of the hierarchical structure formation of galaxies. Theorists argue that small galaxies should form first, and then merge into ever larger objects, driven by the relentless pull of gravity. The numerous galaxy collisions literally tear some galaxies apart and scatter their stars onto wide orbits around the newly created large galaxies, which should give them a faint background glow of stellar light. These predicted pale stellar halos are very difficult to observe due to their low surface brightness, but IllustrisTNG was able to simulate exactly what astronomers should be looking for in their data. "Our predictions can now be systematically checked by observers," Dr. Annalisa Pillepich (MPIA) points out, who led a further IllustrisTNG study. "This yields a critical test for the theoretical model of hierarchical galaxy formation." For the project, the researchers developed a particularly powerful version of their highly parallel moving-mesh code AREPO and used it on the Hazel Hen machine at the High-Performance Computing Center Stuttgart, Germany's fastest mainframe computer, currently ranked nineteenth in the Top500. IllustrisTNG is the largest hydrodynamic simulation project to date for the emergence of cosmic structures. To compute one of the two main simulation runs, over 24,000 processors were used over the course of more than two months to follow the formation of millions of galaxies in a representative region of the universe with nearly one billion light-years on a side. Rendering of the gas velocity in a thin slice of 100-kiloparsec thickness (in the viewing direction), centered on the second most massive galaxy cluster in the TNG100 calculation. Where the image is black, the gas is hardly moving, while white regions have velocities which exceed 1,000 kilometers per second. The image contrasts the gas motions in cosmic filaments against the fast, chaotic motions triggered by the deep gravitational potential well and the supermassive black hole sitting at its center. "Thanks to the computing time obtained from the German Gauss Centre for Supercomputing, we have been able to redefine the state of the art in this field," explains Volker Springel. "The new simulations produced more than 500 terabytes of simulation data. Analyzing this huge mountain of data will keep us busy for years to come, and it promises many exciting new insights into different astrophysical processes." University of California Santa Barbara (UCSB) researchers unlock another piece of the puzzle that is crystal growth. From Mother Nature to our must-have devices, we’re surrounded by crystals. Those courtesy of the former, such as ice and snow, can form spontaneously and symmetrically. But the silicon-based or gallium nitride crystals found in LEDs and other electronics require a bit of coaxing to attain their ideal shapes and alignments. At UC Santa Barbara, researchers have now unlocked another piece of the theoretical puzzle that governs the growth of crystals — a development that may save time and energy in the many processes that require crystal formation. “The way most industrial processes are designed today is by doing an exhaustively large number of experiments to find out how crystals grow and at what rate they grow under different conditions,” said UCSB chemical engineer Michael Doherty, an author of a paper that appears in the Proceedings of the National Academy of Sciences. Snowflakes, for instance, form differently as they fall, depending on variable conditions such as temperature and humidity, hence the widely held belief that no two are alike. After determining the optimal conditions for the growth of the crystal of choice, Doherty added, equipment must be designed and calibrated to provide a consistent growing environment. However, by pooling decades of expertise, Doherty, along with UCSB colleague Baron Peters and former graduate student Mark Joswiak (now at Dow Chemical) have developed a computational method to help predict growth rates for ionic crystals under different circumstances. Using a relatively simple crystal — sodium chloride (NaCl, more familiarly known as table salt) — in water, the researchers laid the groundwork for the analysis of more complex crystals. Ionic crystals may appear to the naked eye — and even under some magnification — to consist of perfectly smooth and even faces. But look more closely and you’ll often find they actually contain surface features that influence their ability to grow, and the larger shapes that they take. “There are dislocations and around the dislocations there are spirals, and around the spirals there are edges, and around the edges there are kinks,” Peters said, “and every level requires a theory to describe the number of those features and the rates at which they change.” At the smallest scale, ions in solution cannot readily attach to the growing crystal because water molecules that solvate (interact with) the ions are not readily dislodged, he said. With so many processes occurring at so many scales, it’s easy to see how difficult it can be to predict a crystal’s growth. Among their insights: Ion size matters. The researchers found that due to its size, the larger chloride ion (Cl-) prevents water from accessing kink sites during detachment, limiting the overall rate of sodium chloride dissolution in water. This proof-of-concept development is the result of the Doherty Group’s expertise with crystallization processes coupled with the Peters Group’s expertise in “rare events” — relatively infrequent and short-lived but highly significant phenomena (such as reactions) that fundamentally change the state of the system. Using a method called transition path sampling, the researchers were able to understand the events leading up to the transition state. The strategy and mechanistic insights from the work on sodium chloride provides a blueprint for predicting growth rates in materials synthesis, pharmaceuticals and biomineralization. The sequencing of the largest genome to date lays the foundation for novel insights into tissue regeneration. A team of researchers led by scientists in Vienna, Dresden and Heidelberg has decoded the entire genetic information of the Mexican salamander axolotl. The axolotl genome, which is the largest genome ever to be sequenced, will be a powerful tool to study the molecular basis for regrowing limbs and other forms of regeneration. After being injured, an axolotl can regrow bones, muscles and nerves in the right places. The decoding of the genome of the Mexican axolotl Ambystoma mexicanu will provide researchers with key insights into the process of tissue regeneration. Salamanders have long served as valuable biological models for developmental, regeneration and evolutionary studies. In particular, the Mexican axolotl Ambystoma mexicanum has received special attention due to its astounding ability to regenerate body-parts. If the cannibalistically inclined animal loses a limb, it will regrow a perfect substitute within weeks, complete with bones, muscles and nerves in the right places. Even more fascinating, the axolotl can repair severed spinal cord and retinal tissue. These qualities and the relative ease in breeding have made it a favourite biological model, cultivated in the lab for more than 150 years. One of the largest axolotl-colonies is maintained by the team of Elly Tanaka, now at the Research Institute of Molecular Pathology (IMP) in Vienna. The Tanaka-group that was based at the DFG-Center for Regenerative Therapies Dresden at the TU Dresden and the Max Planck Institute of Molecular Cell Biology and Genetics (MPI-CBG) until 2016 is studying the molecular cell biology of limb and spinal cord regeneration and how these mechanisms evolved. Over the years, the team has developed an extensive molecular toolkit for the axolotl, including comprehensive transcriptome data that reveal protein-coding sequences in the animal’s genome. Using these tools, Elly Tanaka and her colleagues were able to identify the cells that initiate regeneration and describe molecular pathways that control the process. An international team of researchers led by Elly Tanaka (IMP), Michael Hiller and Gene Myers (both MPI-CBG), and Siegfried Schloissnig of the Heidelberg Institute for Theoretical Studies (HITS) have now sequenced, assembled, annotated, and analysed the complete axolotl genome, the largest genome ever to be decoded. Using the PacBio-platform, a sequencing technology that produces long reads to span large repetitive regions, a total of 72 435 954 reads were sequenced at the DRESDEN Concept Genome Center, a joint operation between the MPI-CBG and the TU Dresden. Software systems that were co-developed by Gene Myers and Siegfried Schloissnig with his team in Heidelberg were used to assemble the genome from these millions of pieces. The powerful sequencing machines that made this whole project possible were financed by the Klaus Tschira Foundation and the Max Planck Society. Citation: The axolotl genome and the evolution of key tissue formation regulators. In future, tiny robots moving in your body could transport medication specifically to where it is needed. Tiny robots need not fear obstacle courses in the future: Scientists from the Max Planck Institute for Intelligent Systems in Stuttgart have developed a minuscule, flexible robot that can master a variety of forms of movement. Its magnetic drive allows it to walk, crawl and roll through difficult terrain. Moreover, it can transport small loads and swim on and in liquids. The millirobot now introduced by the Max Planck researchers in Stuttgart moves over land and water. Jellyfish and caterpillars are just two of the natural role models that inspired the scientists. Through an obstacle course with ease: The millirobot walks, crawls, swims, climbs a step and jumps through a complex environment. The silicone rubber strip with embedded magnetic particles forming the body of the very manoeuvrable millirobot is only four millimetres long. Special Way of Smelling Is Related to a Hunter-Gatherer Lifestyle. When it comes to naming colors, most people do so with ease. But, for odors, it’s much harder to find the words. One notable exception to this rule is found among the Jahai people, a group of hunter-gatherers living in the Malay Peninsula who can name odors just as easily as colors. A new study by Asifa Majid (Radboud University and MPI for Psycholinguistics) and Nicole Kruspe (Lund University) suggests that the Jahai’s special way with smell is related to their hunting and gathering lifestyle. To find out whether it was the Jahai who have an unusually keen ability with odors or whether English speakers are simply lacking, Majid and Nicole Kruspe (Lund University, Sweden) examined two related, but previously unstudied, groups of people in the tropical rainforest of the Malay Peninsula: the hunter-gatherer Semaq Beri and the non-hunter-gatherer Semelai. The Semelai are traditionally farmers, combining shifting rice cultivation with the collection of forest products for trade. The Semaq Beri and Semelai not only live in a similar environment; they also speak closely related languages. The question was: how easily are they able to name odors? “If ease of olfactory naming is related to cultural practices, then we would expect the Semaq Beri to behave like the Jahai and name odors as easily as they do colors, whereas the Semelai should pattern differently,” the researchers wrote in their recently published study in Current Biology. And, that’s exactly what they found. The results were clear. The hunter-gatherer Semaq Beri performed on those tests just like the hunter-gatherer Jahai, naming odors and colors with equal ease.The non-hunter-gatherer Semelai, on the other hand, performed like English speakers. For them, odors were difficult to name. The results suggest that the downgrading in importance of smells relative to other sensory inputs is a recent consequence of cultural adaption, the researchers say. “Hunter-gatherers’ olfaction is superior, while settled peoples’ olfactory cognition is diminished,” Majid says. They say the findings challenge the notion that differences in neuroarchitecture alone underlie differences in olfaction, suggesting instead that cultural variation may play a more prominent role. They also raise a number of interesting questions: “Do hunter-gatherers in other parts of the world also show the same boost to olfactory naming?” Majid asks. “Are other aspects of olfactory cognition also superior in hunter-gatherers,” for example, the ability to differentiate one odor from another? “Finally, how do these cultural differences interact with the biological infrastructure for smell?” She says it will be important to learn whether these groups of people show underlying genetic differences related to the sense of smell. This study was funded by The Netherlands Organisation for Scientific Research as well as the Swedish Foundation. Analysis of ancient DNA found that Scandinavia was settled by hunter-gatherers via a southern and a northern route, and reveals that agriculture was likely introduced by migrating agriculturalists. Skull included in this study from Ölsund, Hälsingland, Sweden, dating to around 2,300 BCE, in the ancient DNA laboratory at the Max Planck Institute for the Science of Human History. Map showing locations and timeline of the samples introduced in this study. Credit: Mittnik et al. The Genetic Prehistory of the Baltic Sea Region. Nature Communications (2018). "Eastern Hunter-Gatherers were not present on the eastern Baltic coast, but a genetic component from them is present in Scandinavia. This suggests that the people carrying this genetic component took a northern route through Fennoscandia into the southern part of the Scandinavian peninsula. There they genetically mixed with Western Hunter-Gatherers who came from the South, and together they formed the Scandinavian Hunter-Gatherers," explains Johannes Krause, Director of the Department of Archaeogenetics at the Max Planck Institute for the Science of Human History, and senior author of the study. "Interestingly, we find an increase of local Eastern Baltic hunter-gatherer ancestry in this population at the onset of the Bronze Age," states Alissa Mittnik of the Max Planck Institute for the Science of Human History, lead author of the study. "The local population was not completely replaced but coexisted and eventually mixed with the newcomers." 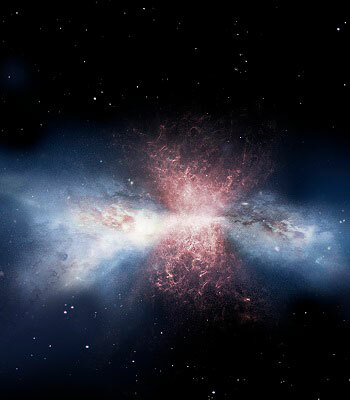 Astronomers questioned how anything could survive the heat of the energetic outflows, but a new theory from researchers in Northwestern University's Center for Interdisciplinary Research and Exploration in Astrophysics (CIERA) predicts that these molecules are not survivors at all, but brand-new molecules, born in the winds with unique properties that enable them to adapt to and thrive in the hostile environment. The theory, published in the Monthly Notices of the Royal Astronomical Society, is the work of Lindheimer post-doctoral fellow Alexander Richings, who developed the computer code that, for the first time, modeled the detailed chemical processes that occur in interstellar gas accelerated by radiation emitted during the growth of supermassive black holes. Claude-André Faucher-Giguère, who studies galaxy formation and evolution as an assistant professor in Northwestern's Weinberg College of Arts and Sciences, is a co-author. 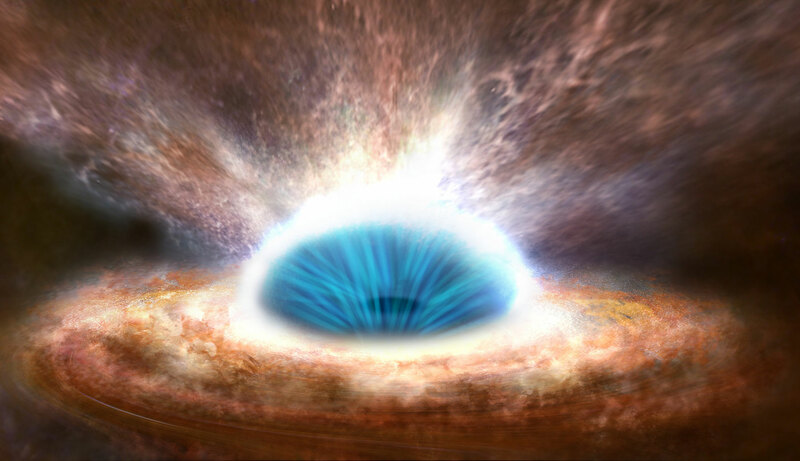 "When a black hole wind sweeps up gas from its host galaxy, the gas is heated to high temperatures, which destroy any existing molecules," Richings said. "By modeling the molecular chemistry in computer simulations of black hole winds, we found that this swept-up gas can subsequently cool and form new molecules." In 2015, astronomers confirmed the existence of energetic outflows from supermassive black holes found at the center of most galaxies. These outflows kill everything in their path, expelling the food - or molecules - that fuel star formation. These winds are also presumed to be responsible for the existence of "red and dead" elliptical galaxies, in which no new stars can form. Then, in 2017, astronomers observed rapidly moving new stars forming in the winds - a phenomenon they thought would be impossible given the extreme conditions in black hole-powered outflows. New stars form from molecular gas, so Richings and Faucher-Giguère's new theory of molecule formation helps explain the formation of new stars in winds. It upholds previous predictions that black hole winds destroy molecules upon first collision but also predicts that new molecules - including hydrogen, carbon monoxide and water - can form in the winds themselves. "This is the first time that the molecule formation process has been simulated in full detail, and in our view, it is a very compelling explanation for the observation that molecules are ubiquitous in supermassive black hole winds, which has been one of the major outstanding problems in the field," Faucher-Giguère said. Unlike the Milky Way, this semi-spiral collection of a few tens-of-billions of stars lacks our galaxy's rich abundance of heavy elements, like carbon, oxygen, and nitrogen. With such a dearth of heavy elements, astronomers predict that the LMC should contain a comparatively paltry amount of complex carbon-based molecules. Previous observations of the LMC seem to support that view. 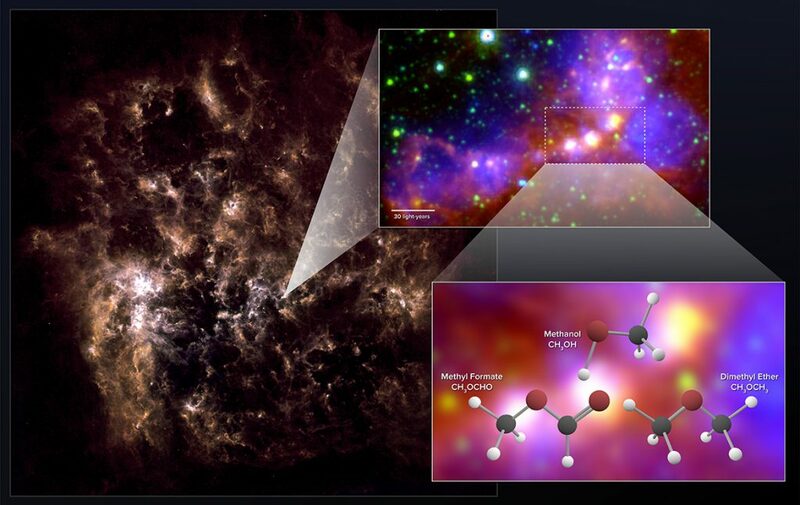 New observations with the Atacama Large Millimeter/submillimeter Array (ALMA), however, have uncovered the surprisingly clear chemical "fingerprints" of the complex organic molecules methanol, dimethyl ether, and methyl formate. Though previous observations found hints of methanol in the LMC, the latter two are unprecedented findings and stand as the most complex molecules ever conclusively detected outside of our galaxy. Astronomers discovered the molecules' faint millimeter-wavelength "glow" emanating from two dense star-forming embryos in the LMC, regions known as "hot cores." These observations may provide insights into the formation of similarly complex organic molecules early in the history of the universe. "Even though the Large Magellanic Cloud is one of our nearest galactic companions, we expect it should share some uncanny chemical similarity with distant, young galaxies from the early universe," said Marta Sewiło, an astronomer with NASA's Goddard Space Flight Center in Greenbelt, Maryland, and lead author on a paper appearing in the Astrophysical Journal Letters. Astronomers refer to this lack of heavy elements as "low metallicity." It takes several generations of star birth and star death to liberally seed a galaxy with heavy elements, which then get taken up in the next generation of stars and become the building blocks of new planets. "Young, primordial galaxies simply didn't have enough time to become so chemically enriched," said Sewiło. "Dwarf galaxies like the LMC probably retained this same youthful makeup because of their relatively low masses, which severely throttles back the pace of star formation." "Due to its low metallicity, the LMC offers a window into these early, adolescent galaxies," noted Remy Indebetouw, an astronomer at the National Radio Astronomy Observatory in Charlottesville, Virginia, and coauthor on the study. "Star-formation studies of this galaxy provide a stepping stone to understand star formation in the early universe." The astronomers focused their study on the N113 Star Formation Region in the LMC, which is one of the galaxy's most massive and gas-rich regions. Earlier observations of this area with NASA's Spitzer Space Telescope and ESA's Herschel Space Observatory revealed a startling concentration of young stellar objects - protostars that have just begun to heat their stellar nurseries, causing them to glow brightly in infrared light. At least a portion of this star formation is due to a domino-like effect, where the formation of massive stars triggers the formation of other stars in the same general vicinity. Complex organic molecules, those with six or more atoms including carbon, are some of the basic building blocks of molecules that are essential to life on Earth and - presumably - elsewhere in the universe. Though methanol is a relatively simple compound compared to other organic molecules, it nonetheless is essential to the formation of more complex organic molecules, like those that ALMA recently observed, among others. If these complex molecules can readily form around protostars, it's likely that they would endure and become part of the protoplanetary disks of young star systems. Such molecules were likely delivered to the primitive Earth by comets and meteorites, helping to jumpstart the development of life on our planet. The astronomers speculate that since complex organic molecules can form in chemically primitive environments like the LMC, it's possible that the chemical framework for life could have emerged relatively early in the history of the universe. This research is presented in a paper titled "'The detection of hot cores and complex organic molecules in the Large Magellanic Cloud," by M. Sewiło, et al., which appears in the Astrophysical Journal Letters. Diverging from centuries of established behavioral norms, red fox and coyote have gone against their wild instincts and learned to coexist in the urban environment of Madison and the University of Wisconsin-Madison campus, according to a recently published study in the journal PLOS One. A fox wanders through a city street in Madison, Wisconsin. "It gives us a better understanding of the types of habitats foxes and coyotes prefer to use in developed and residential areas," says Mueller, who now owns a wildlife management company in Milwaukee. "This in turn can help us reduce the kinds of problems that can arise when wild animals and people come into contact." "We found an instance where a coyote routinely visited a fox den over about a two or three week period," Drake said. "But the fox and kits did not abandon the den, suggesting to us that they didn't feel predation pressure from the coyote." A map showing some of the places where foxes and coyotes roam in Madison, Wisconsin. It was collected from GPS collars placed on the animals by David Drake, professor of forest and wildlife ecology, and his former graduate student, Marcus Mueller,as part of a study of urban canids. Marked in blue are the coyote home ranges, and in red are the fox home ranges. Fox and coyotes show more tendency to overlap in urban settings than in rural ones, according to a new study published by the researchers in Jan. 2018. "We think that this antagonistic relationship between coyotes and fox is breaking down and relaxing in the urban environment because the food is so abundant that they don't have to compete for a limited resource like they do out in the non-urban areas," Drake said. This study was conducted in Madison, Wisconsin over a 27-square-mile area encompassing the UW-Madison campus, outlying residential neighborhoods, and some commercial and small natural areas. Drake and Mueller, with help from UW-Madison students and interested members of the public, trapped and radio-tagged 11 coyotes and 12 red foxes. The researchers triangulated the animals' positions using a technology called telemetry once a week for five-hour periods at a time between Jan. 2015 and Dec. 2016. Drake and Mueller classified the spaces the animals traveled through into five categories based on the amount of human development. This allowed them to determine both species' preferences when it came to where to make their homes with respect to people and to each other. Drake and Mueller's study suggests that the propensity for red foxes to avoid natural spaces may be due to the coyote's role as an apex predator (higher on the food chain). Because they are larger than foxes, coyotes get first dibs on where they call home, which is usually wherever they can be isolated and away from people. On Madison's west side, the home ranges of the foxes overlap with the coyotes. Drake suspects this is because Owen Park, the conservation space where the coyotes on the west side have made their home, is smaller than the spaces that the UW Arboretum and Picnic Point coyote packs occupy. This leads them to wander outside their territory and into developed areas, where foxes already live. 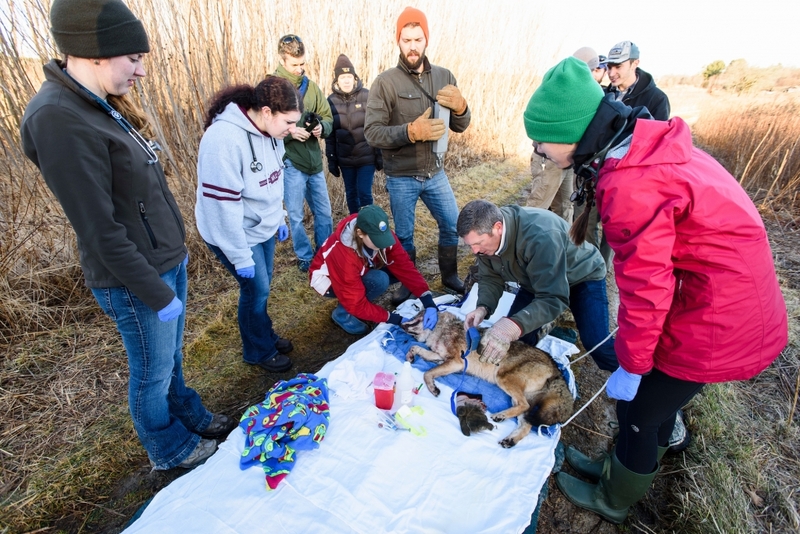 On Dec. 15, 2015, a group of student veterinarians draw a blood sample from a sedated, 36-pound adult coyote caught at Curtis Prairie at the Arboretum as part of a research effort to study the behavior of growing fox and coyote populations in Madison. Pictured from left to right are veterinarians Miranda Torkelson, Kaylyn Goertz, Holly Hovanec and Melanie Iverson. The UW Urban Canid Project is led by Professor David Drake (kneeling at center). Both animals are crepuscular, or stalk about from sundown to sunup, to avoid human activity. But red foxes are less timid and have been known to den in high-traffic areas of the UW-Madison campus. Because of the growing tide of canids and wildlife moving into the city, Drake established the Urban Canid Project to encourage citizens and campus visitors to record sightings of animals like red foxes and coyotes, which he hopes will one day replace the need for radio-telemetry tracking. This is time intensive for the scientists, who must search for a signal from the animals' collars to locate them and then stay close enough to track their movements. This study was funded by the Department of Forest and Wildlife Ecology, the UW-Madison Graduate School, the Milwaukee County Parks Department., and private donations to a gift account for this study through the UW Foundation. Top: Electron movement in solar wind parallels magnetic field direction. Bottom: After magnetic reconnection, the electrons lose their alignment with Earth’s magnetic field. 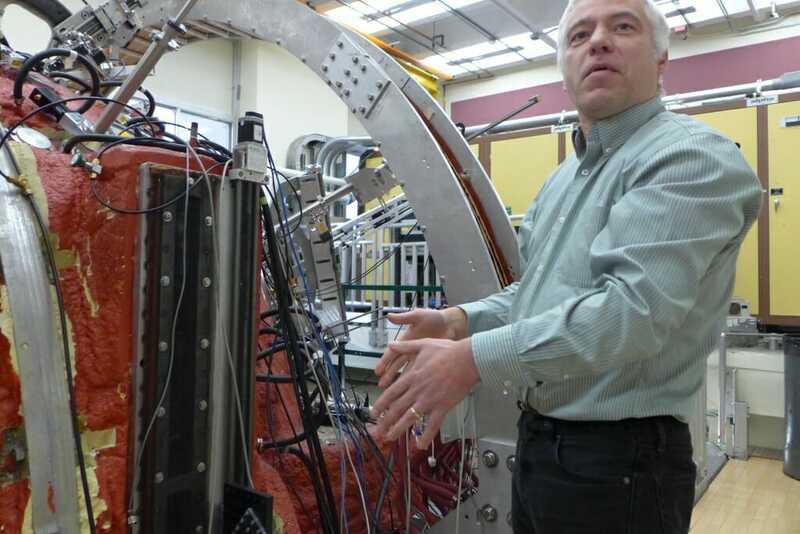 Jan Egedal, professor of physics at UW-Madison who lead an exploration of magnetic reconnection, stands beside a chamber used for experiments in that exotic phenomenon. 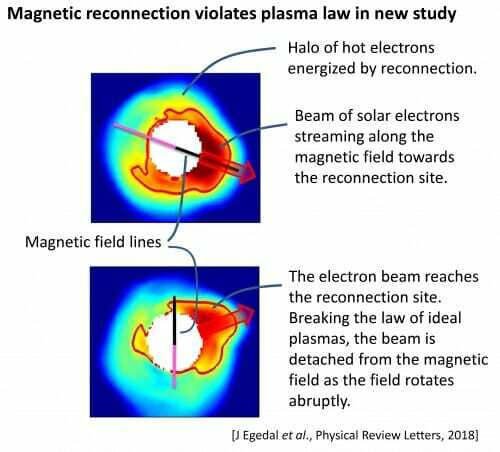 Magnetic reconnection seems to be involved in some of the most violent explosions in the universe; the recent study was the clearest view of the magnetic reconnection ever measured in space. The results "blew my mind," he says. This visualization shows the motion of a single electron undergoing magnetic reconnection. As the spacecraft approaches the reconnection region, it detects first high-energy particles, then low-energy particles. Structure of the human Polycomb Repressive Complex 2 (PRC2) bound to cofactors obtained by cryo-electron microscopy. Both cofactors mimic the histone protein tail to stabilize and stimulate the enzymatic activity of PRC2. This montage of the full PRC2 with two nucleosomes is based on the superposition of the cryo-EM maps of PRC2 with and without the nucleosomes to show the consistency of the observed nucleosome binding configuration with the full PRC2 structure. From left, Simon Poepsel, Eva Noagles, and Vignesh Kasinath were part of a team of scientists that led the research. This work is complemented by a second studythat presents snapshots of PRC2 binding to the histone proteins that it modifies as a signal for gene silencing. The structures, which have been published in Nature Structural and Molecular Biology on January 29 by Poepsel, Kasinath and Nogales this week, illustrate beautifully the action of this sophisticated complex. “PRC2 can simultaneously engage two nucleosomes,” said Poepsel, first author of this study. Climate change will be a bigger blow to the survival chances of reptiles than birds and mammals predict scientists. New research that analyzed more than 270 million years of data on animals shows that mammals and birds – both warm-blooded animals – may have a better chance of evolving and adapting to the Earth’s rapidly changing climate than their cold-blooded peers, reptiles and amphibians. Mammals and birds may have a better chance of adapting to climate change. The planet’s climate has changed significantly throughout history and the researchers found that these changes have shaped where animals live. For example, the planet was fairly warm and tropical until 40 million years ago, making it an ideal place for many species to live. As the planet cooled, birds and mammals were able to adapt to the colder temperatures so they were able to move into habitats in more northern and southern regions. “It’s possible that they will eventually adapt and could move into these regions but it takes longer for them to change.” said Rolland. “These strategies help them adapt to cold weather but we rarely see them in the ectotherms or cold-blooded animals,” he said. The study was a collaboration between scientists at UBC and in Switzerland and Sweden. It was published this week in Nature Ecology. Citation: The impact of endothermy on the climatic niche evolution and the distribution of vertebrate diversity.